STS actively participated in the International day for Occupational Safety and Health Exhibition – 2018. 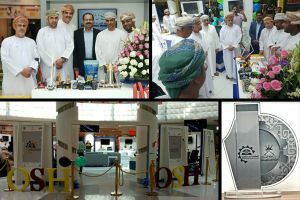 The exhibition was held at Oman Avenues Mall from 29/04/2018 to 02/05/2018. The event, which was hosted by The Ministry of Manpower,was attended by officials from the government and private sectors.Participantsincluded Petroleum Development Oman,Occidental of Oman, Oman LNG, Royal Oman Police (ROP) among others. The exhibition marks the Sultanate's participation with other countries around the world in marking the World Day for Safety and Health at Work, which is observed on April 28 every year to raise public awareness of Occupational Safety and Health in the Sultanate of Oman. The exhibition displayed occupational safety and health education materials such as posters, books, videos and safety instruments. STS' stand received substantial footfall from Government, Private and public sectors.